make sure you look at some of our extravagant flowers to decorate the outside or inside of your house such as Burgundy and Yellow Novelty Flower, Bronze Football Mum Flower, Hocus Pocus Rose, or Protea Fresh Tropical Flower. Carnations, daisies and greens are also very popular this time of the year. These flowers will surely add a unique touch to your Halloween theme. Thanksgiving is special time of year spent with family and friends. Whether you are sitting around the table eating turkey and stuffing or watching football, the time spent with people you love is priceless. We have beautiful fall centerpieces that would look great on your dining room table, coffee table, or placed throughout your home. Take a look at our Fall In Love Fresh Table Arrangements, Hocus Pocus Fresh Table Arrangements, and Falling Leaves Fresh Cut Centerpieces. 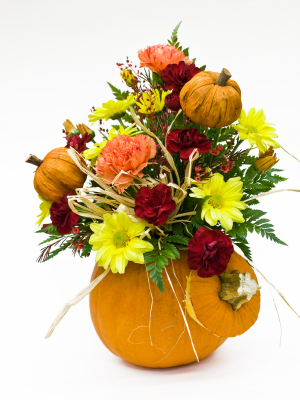 These arrangements have vibrant fall colors and will emit that “fall feeling”. Fiftyflowers.com has an enormous selection of flowers for weddings, holidays, and special occasions. Our customer service is always available to assist you in choosing flo0wers that best suit your needs. Shop online now or call us at 877 50ROSES. Featured flowers ~ Shop now! What you did not know about Ecuadorian Roses!